Responsible data management embodies the FAIR principles of making data findable, accessible, interoperable, and reusable. FAIR has helped focus minds and provided readily adopted terminology and guidelines, which in turn will help realise the benefits of accelerated analysis, with machines, at scale. In consequence, research communities and research institutions are faced with the task of rising to the challenge of FAIR and responsible data management. Advancing the adoption of FAIR requires sharing protocols, practices, policies, methodologies, and approaches for responsible data management. The open science and open data movements have made significant progress in certain research communities and domains, but less so in others. While good practices have been developed within some research communities, it is in research institutions and universities that data management and some long term stewardship must take place. Sometimes reluctantly, research institutions have been obliged to take greater responsibility for research data management by the needs of researchers and their communities on the one hand and by the requirements of national funders on the other. There are opportunities for knowledge sharing and coordination across a number of these axes: between research disciplines and communities; between research communities and institutions; and internationally among institutions. The biomedical and genomics fields, for example, have made considerable progress with data sharing and with issues of nomenclature and semantics. Much research activity of the last two decades could not have happened without community agreements on data sharing and mechanisms for managing concepts, semantic specifications and ontologies. Likewise, many biomedical research domains are addressing the challenges of controlled sharing of sensitive and restricted data, following the FAIR principles but with respect to ethical and legal criteria where these prevent certain data from being fully Open. The aim of this workshop is to bring together researchers, data management experts, policy leaders and to facilitate knowledge sharing between research communities and between institutions. Perspectives from all domains and from research institutions are in scope. At least one session will examine progress in the biomedical community and lessons to be learnt, particularly in relation to good practice and mechanisms for controlled sharing of sensitive and restricted data. The deadline for proposals is Mon 4 March and accepted speakers will be notified no later than Tue 12 March. 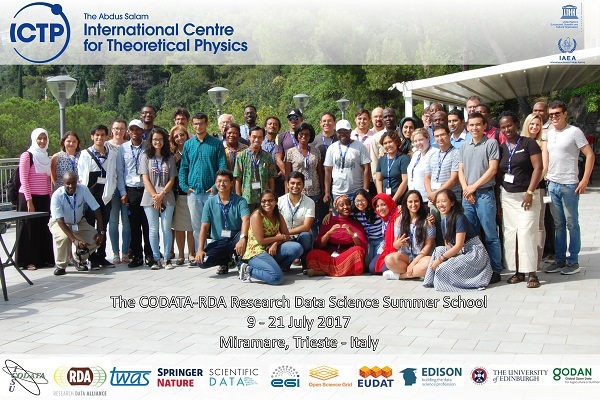 After the workshop, selected presenters will be invited to submit a full paper to the CODATA Data Science Journal where they will form a special collection. FAIR data: implications and responsibilities 1) for research communities and 2) for research institutions. FAIR data stewardship and knowledge sharing. What progress has been made in RDM and FAIR data stewardship? What can be learnt from biomedical research and from other domains? Limits of open data and how do deal responsibly with sensitive data. What can be learnt from biomedical fields and other fields for the controlled sharing of sensitive data? RDM, FAIR stewardship services and research infrastructures 1) for research communities and 2) for research institutions. How are research communities and/or research institutions implementing research infrastructures for RDM and FAIR stewardship? How are they tackling related and supporting issues such as: a) developing skills and capacity; b) addressing policy, legal and ethical issues; c) aligning strategies and priorities with FAIR and RDM responsibilities? Alignment of domain and institutional RDM and FAIR stewardship: What experiences exist and mechanisms are there for aligning domain and institutional RDM and FAIR stewardship? Examples of collaboration between research communities, domain research infrastructures and institutions will be particularly welcome. The programme committee and organisers are committed to ensuring this is a no-fee event. To help with this ambition, we will be very grateful for financial support and sponsorship. Please contact Jane Greenberg <jg3243@drexel.edu>, Simon Hodson <simon@codata.org> for further information. This document provides a quick and accessible list of activities, deliverables and impact from the past year. It then highlights some important upcoming activities and events for 2019. 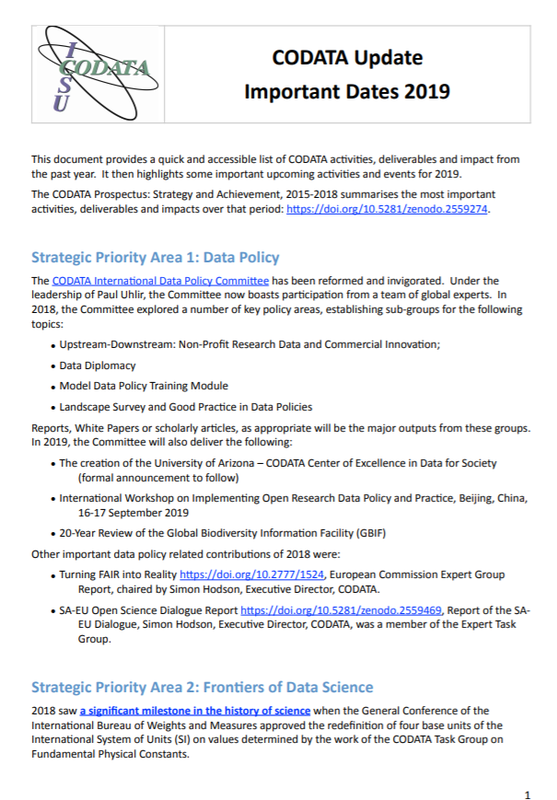 Additionally, the CODATA Prospectus: Strategy and Achievement, 2015-2018 summarises the most important activities deliverables and impacts over that period: https://doi.org/10.5281/zenodo.2559274. 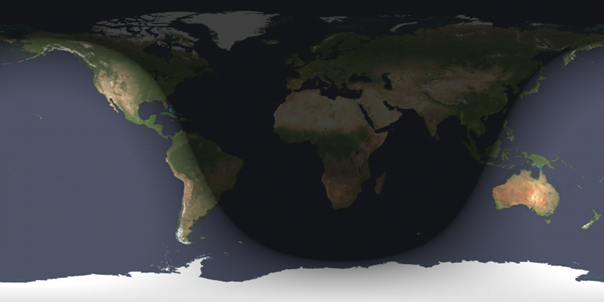 Sun 31 March and Mon 1 April 2019, Drexel University, Philadelphia, USA. The workshop will feature invited speakers and an expert panel discussion, selected research and practice papers from an open call, a poster and lightning talks session, as well as workshop sessions on mechanisms for knowledge sharing and on issues of responsibility and sensitive data. identify concrete mechanisms for knowledge sharing between research communities and between research institutions. 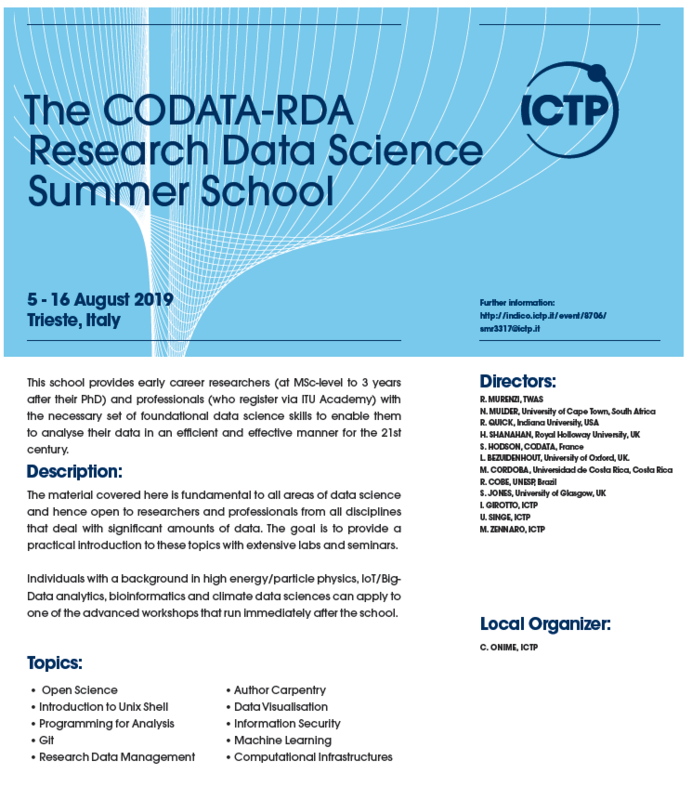 The workshop builds on a successful Göttingen-CODATA Symposium on RDM in Institutions which was held in March 2018 and like its predecessor will result in a special collection of the CODATA Data Science Journal. Bonnie Carroll, CODATA Secretary General and Information International Associates, Inc. (IIa). Rosina Weber, Associate Professor, College of Computing and Informatics, Drexel University. ‘A milestone in the history of science’: the redefinition of the International System of Units was based on the work of CODATA and the Task Group for Fundamental Constants. International Data Week, held in Gaborone, Botswana was an enormous success with 850 participants. Selected paper will be published in the CODATA Data Science Journal. The vision and strategy for the African Open Science Platform was launched at Science Forum South Africa, in a presentation by co-chair Khotso Mokhele. A founding members’ meeting will be hosted at the Biblioteca Alexandrina later in 2019. The ISC CODATA initiative on Data Interoperability Integration for Interdisciplinary Research made progress, notably through a very successful Dagstuhl Workshop co-organised with the DDI Alliance: this will result in a series of articles on data integration challenges in cross-disciplinary research areas. Other notable activities include the work of the Data Policy Committee, a major contribution to the European Commission report on Turning FAIR into Reality and the ongoing series of CODATA-RDA Data Schools. Finally, we are grateful for the enormous contribution that Past President Geoffrey Boulton has made to CODATA. The CODATA General Assembly at the University of Botswana 9-10 November elected a new President, Barend Mons, and a new Executive Committee. We look forward to further increasing CODATA’s impact and to promoting international collaboration for Open Science and FAIR data. 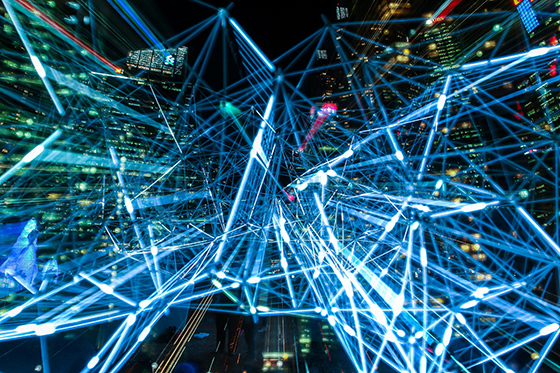 Big Data can make important contributions towards technical progress, but what's needed are innovative technologies, strategies and competencies to address societal needs. Outer space and disaster response experts recently gathered in Bonn, Germany to discuss how "big data" can reduce the risk of natural disasters in Africa and support response efforts. Interest Group meetings: continue discussions and the creation of outputs, etc. Birds of a Feather (BoF) meetings: Is there a topic that you think RDA should address? Make sure you submit an application for a Birds of a Feather session aimed at exploring new potential Working or Interest group topics. It will help you identify an audience, build support and start the work on your Case statement or Charter for an RDA Working or Interest group. We encourage all submissions, the breakout sessions are designed to provide an opportunity for discussion, sharing experiences and best practices, laying down concrete action plans. All Working and Interest groups are free to choose the format and workplan for their sessions while we strongly encourage the organisation of working meetings. Be inclusive. Be creative. Be inspiring. And put your eyes on the horizon. This is the full Call for Contributions for the 16th International Conference on Digital Preservation, iPRES 2019. Deadline for all submissions is 18 March 2019. All submissions and presentations should be in English. The theme for iPRES 2019 – Eye on the Horizon – aims to broaden the voices and approaches participating in the conference. In keeping with the theme, we will embrace creative proposals that demonstrate how research and theory directly impact and influence practice at all levels. iPRES brings together a wide range of practitioners, researchers, educators, providers, students, and others to share lessons learned from engaging in digital preservation, including recent practice, research, developments, and innovations. Instructions for each peer-reviewed submission type (papers, panels, posters, demonstrations, workshops, tutorials and hackathon sessions) are to be found in the Submission Instructions section.